For more than 30 years, the Flea Market of Bogota, Mercado De Las Pulgas De San Alejo has been attracting a significant number of tourists and locals. Some of the invaluable antique home decor items such as Vitrolas, Old Radios, Old Coins, Old Maps, Weights, and Scales. With the highest concentration of Antiques in the country, the market has more than 350 stands. The market also offers bicipacqueo service, food zones and suitable place for both merchants and visitors. Music Lovers, Tourist Fairs, Vintage Fashion and many other themed meetings are held in this market. The flea market with quirky and traditional furniture, toys, home decors, plants, groceries, clothes and many other craft items is more like a drive-in museum that speaks of the antique and intimate architecture of an era. Personalize your visit to the city by chalking out a plan using Bogota trip planner. Hotels like Hotel Confort 80 Castellana, Hotel Casa Lozada and Hotel Excelsior will solve your problem of where to stay in Bogota. Explore the best Bogota vacation packages that will take to you important landmarks of the city! For getting in, check out how to reach Bogota. This market is worth visiting! Calling it a flea market is not appropriate because it has more artisan arts and crafts than resale goods more associated with flea market. We went on a Sunday afternoon and of was a lot of fun. It is pretty expansive and crowded so allow yourself 1-2 hours. Very upscale!!! Gorgeous stuff here! Plan to bring plenty of cash to get the best price. Everything from crafts and home kitchen items to fine art endeavors. There is also an "off the main drag" area where you can get some less expensive items. Was nice to walk around and look at the local goods. There was a lot of good smelling food too. I would recommend a nice Sunday afternoon since a lot of things are closed anyway. Also, someone has a baby sloth. 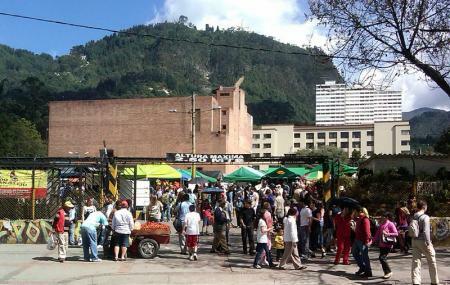 Usaquén Is a lovely spot in Bogotá and the flea market provides the perfect reason to pay the neighborhood a visit. There is a real buzz on a Sunday morning. This is the perfect spot to find gifts and souvenirs if you're travelling. You'll also find a good lunch to meet every budget - street food to great restaurants. I would definitely recommend a few hours here. So fun. We loved walking through and seeing the market. We bought a couple of items that happened to be from the same family too. Love the craftsmanship and time put into all of the booths.